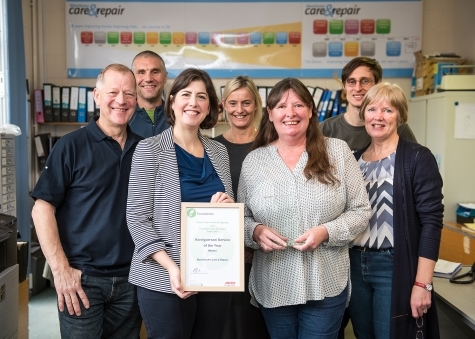 Lucy Powell MP visited Manchester Care & Repair at the beginning of November. She had been touched by a thank you note sent to Care & Repair by one of her constituents and wanted to meet the client and home improvement agency staff herself. Although the client wasn’t well enough to be there, Lucy took the time to meet all the staff, particularly handyman Steve Nicholson (pictured, far left). Lucy also took the opportunity to re-present locally the Foundations Handyperson Service of the Year award which was presented to Manchester Care & Repair earlier this year in a ceremony at the House of Lords. I had your workman Steve Nicholson to do me some plumbing leaks. I had suffered emptying buckets, going up and down the stairs, pulling toilet chains to stop the overflow pipes for nearly 12 months. I paid local men but they walked off the job, leaving both toilets still as bad and me £25 lighter. Not only did Mr Nicholson do a lovely clean job, he was perfectly friendly and advised me to try and get out slowly, not to stay in on lovely days. So after he left I pulled myself together, took a taxi to Piccadilly and then the metro to Bury. I bought my knitting wool, had some dinner and came back tired out but feeling so good. I haven’t been out only for my chemo to hospital in two and a half years, so very tired but feeling so proud. I was frightened of not making it, but was fine. This entry was posted on Monday, November 7th, 2016 at 9:00 am	and is filed under General News, Press Releases. You can follow any responses to this entry through our RSS feed. Both comments and pings are currently closed.